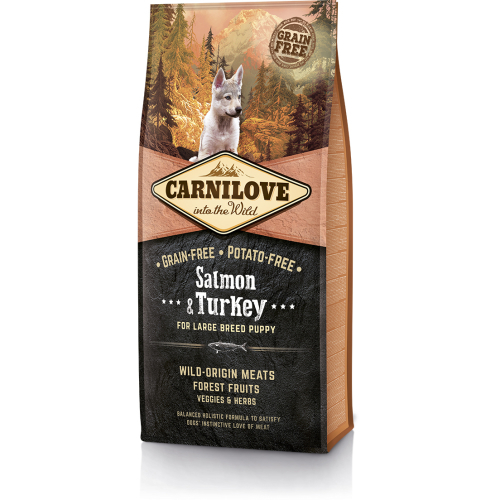 Carnilove Salmon & Turkey Large Breed Puppy food is a tasty dry food formulated with respect for the natural origins of dog, therefore its grain-free and potato free. Containing 70% meat and 30% forest fruits, vegetables and herbs it’s an ideal and delicious food for your puppy to grow up on! •	Salmon is a brillant source of highly digestible proteins and omega-3 unsaturated fatty acids which all has a positive effect on mental development, the cardiovascular system and reduced blood sugar levels. It also improves the quality and appearance of your puppy’s hair and skin! •	Turkey is rich in digestible proteins and has strong levels of trace elements, such as zinc. Turkey is also a source of vitamins B3 and B6, which are vital for proper brain function, good muscle tone, and healthy growth. •	Made with quality ingredients.